Delivering Premium Solutions Color doppler high end hcu with 15" touch screen monitor and 2 transducer sockets. 128 phys. channels, 10 imaging levels, compatible to HD probes and latest generation probes, convertible monitor, exchangable battery. Classical keyboard panel. 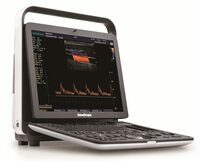 SonoScape S9 Pro is the latest member of the SonoScape Premium HCU family. Combining the latest advances in display technology provides more accurate, faster and effortless diagnosis. This trend setting and exquisite HCU system will provide all Clinicians with advanced clinical tools and the power to reveal subtle detail which will assist with critical decisions with the greatest of confidence. Wide range of applications including cardiovascular, radiology, OB/GYN, urology, small parts, musculoskeletal, abdomen etc.